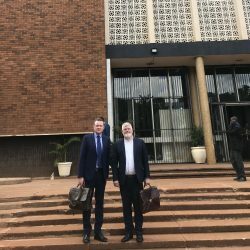 Michael Ivers QC, an executive officer of the Bar Human Rights Committee of England and Wales (BHRC), returned Monday from Zimbabwe where he has been conducting a number of trial observations over the last week in and around Harare. These follow unrest during anti- government protests in the days after 14th January, where acts of violence against property and persons were reported to have been perpetrated in several places in Zimbabwe. As well as observing at the trials of some of those arrested, Mr Ivers QC spoke to a number of those involved in different roles in the Criminal Justice System and also coordinated with two representatives from the American Bar Association (ABA) conducting their own observations. BHRC calls on the Zimbabwe government and judicial system to ensure that international law fair trial rights are met for those arrested. BHRC welcomes the recent comments of Chief Justice Luke Malaba in supporting the role of defence lawyers assisting those accused. Over 1,000 people arrested in total. A significant number of these in ‘dragnet’ operations. Wholesale refusal of bail for those arrested in the initial period. Deeply worrying fast-tracking of trials with little time for defence preparation. A lack of information about charges and evidence and inadequate disclosure. Many large multi-handed cases in some cases with over 50 defendants raising significant practical difficulties in achieving a fair trial. Haphazard and dangerous dock investigations. A clear risk of ‘group’ convictions. Children tried together with adults in some cases. You can read Michael Ivers QC’s article in Independent here. “Over 1000 people were arrested; a significant number of those in apparently ‘dragnet’ and occasionally indiscriminate operations by both police and army. The immediate response in the magistrates’ courts appeared to be a wholesale denial of bail rather than individual decisions. Subsequently a deeply worrying ‘fast tracking’ of criminal cases occasionally without legal representation and even where there was representation inadequate time and facilities to prepare a defence with haphazard and dangerous dock identifications. An additional feature has been large multi-handed cases with over 50 defendants which has necessitated lawyers taking on a large number of clients with little realistic chance of obtaining individual instructions in the timeframe moreover a wholly inadequate disclosure of the case they have to meet. On occasion, lawyers have not even being informed of charges still less the evidence in advance. Whilst individual lawyers are doing their best within the constraints to forward their clients cases fearlessly such trials fail to meet minimum fair trial norms. This is the case even where many in the judiciary are seeking to allow a robust presentation of the defence. This cannot realistically ameliorate the systemic failures at the initial stages of the proceedings. There is a clear danger of ‘group’ convictions rather than individual findings from such flawed processes. Unusually youths have been tried together with adults. BHRC urges the Zimbabwe Government to ensure the integrity of its Criminal justice system, its strong constitution, and adherence to the right to a fair trial. The strength of any justice system is evidenced in how successful it is in ensuring due process irrespective of the challenges being faced. You can read BHRC’s previous statement on the trial in Zimbabwe here.